and all of the cookies and treats you spent all that time baking were gobbled up well before you got a chance to sit down and enjoy them. 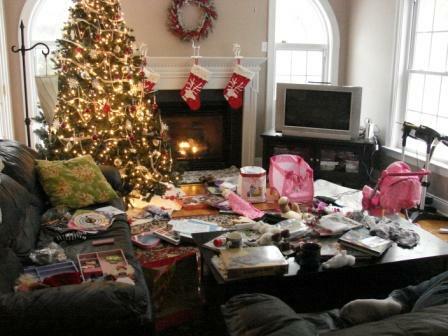 Now you get to clean the whole place all over again (because we don’t like to start a new year with a messy house now, do we?) prepare yet more food for your roving gangs of always – ravenous children and realize that since you’re an adult you don’t have any of the cool new toys and what – nots to play with and keep you occupied through the rest of the winter like the kids do (did I also mention my sewing machine needle broke on Christmas Eve?). Le sigh. Yes, I swore I’d relax after christmas. I just don’t see it happening – at least not until everyone goes back to school and work next week. For now my sanity is at the mercy of those previously mentioned roving gangs, who are at least well – occupied with new games to play. 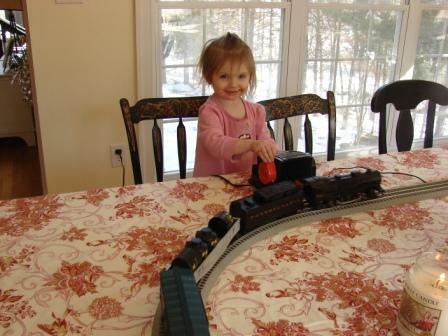 They also have their aunt Maddie here to keep them busy. 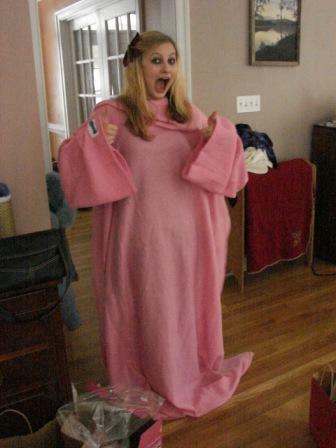 She’s keeping warm and looking like a big blob of pink bubble gum thanks to her new snuggie. Did I also mention I think my goat may be pregnant? We had a male goat here for about 2 days back in November (another story for another time) and even though she hid from him as much as she could she’s also been getting fatter and fatter and I can’t seem to feed her enough no matter what I do. Since the male was a significantly larger breed there is a real danger that any offspring would become stuck in the birthing process and baby and mama could both die. This means I am forced to get a vet involved and the most likely outcome would be a goat c-section. (This is where my supportive spouse tries to convince me to see if anyone wants a free goat/goats). Ah yes, this is my life. Here’s hoping for a better, or at least easier, 2010. 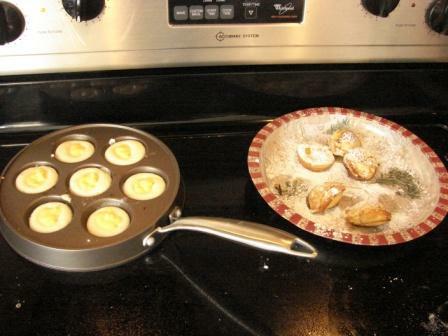 And as an offering for that I made a plate full of aebelskivers with my new pan (thank you mom and dad!). Yummy, cream – filled puff pancakes coated with powdered sugar. Hey Universe – these are for you!